HauteLook is having a ton of Urban Decay stuff on sale right now! Go check them out! 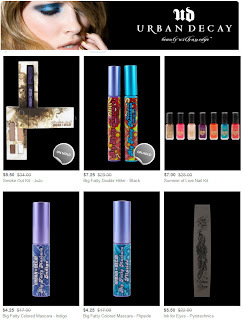 They have mascaras, eyeshadows, lip glosses and more. @MakeupJunkie88 yeah I was in the same boat too but the man bought me two things hehe...just too good of a deal to pass up. Yaaay I got a couple of the colorful mascaras. I got Black Cherry and Flipside.. I hope they're pretty!